Welcome back! I only had that brief chance to drop a “Happy Thanksgiving” note on you last week, so now we’re all back here in one place. At least for a while. We’re really traveling a ton these days, which is great because we’re seeing family and going to fun places, but it also really slows down my progress on the new book “How Far?” because there is so little time to sit quietly in my office and write. Today is Thursday Blog Day, so this takes precedence and hopefully I’ll finish the chapter I’m currently working on, when I carve out some time tomorrow. 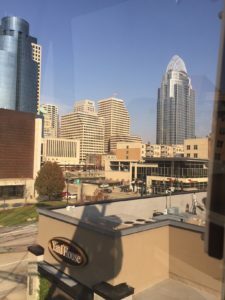 We’d already gone to Cincinnati and gotten back home when I posted last week, so let’s tell a few of those tales, shall we? We went down to see nephew Colin who took a new job in Cincinnati and has an apartment there. He’s a great guy and we share a similar quirky sense of humor, so it’s always fun to see him. And it was great to see his new apartment. It’s in the city and just about a block away from a major street full of bistros, coffee shops, and bars. We walked all around and really loved it. Great vibe! I hadn’t been to Cincinnati since probably 1994, if memory serves me. I remember thinking there was nothing really remarkable, good or bad, about the place but this trip was a very positive eye-opener. It seems like a great town, and the downtown urban scene is very vibrant. It’s also home to the renowned Cincinnati Zoo and that was one of our primary targets during our short visit. Barbara followed the adorable baby hippo Fiona, online, from right after she was born at the Cincinnati Zoo, and we were hoping to see her. Unfortunately, by the time we got there on Saturday afternoon she was no longer out and about in her outdoor area, and the public isn’t allowed inside to see her there. It was still a fun trip to what is obviously a great zoo. It was also their big holiday tree-lighting ceremony just after sunset, and that was pretty epic. They do it right! I mentioned briefly last week that I had a ferris wheel story to tell. This is that story. Currently, there’s a big ferris wheel (it tours the country) on the riverfront in Cincinnati. 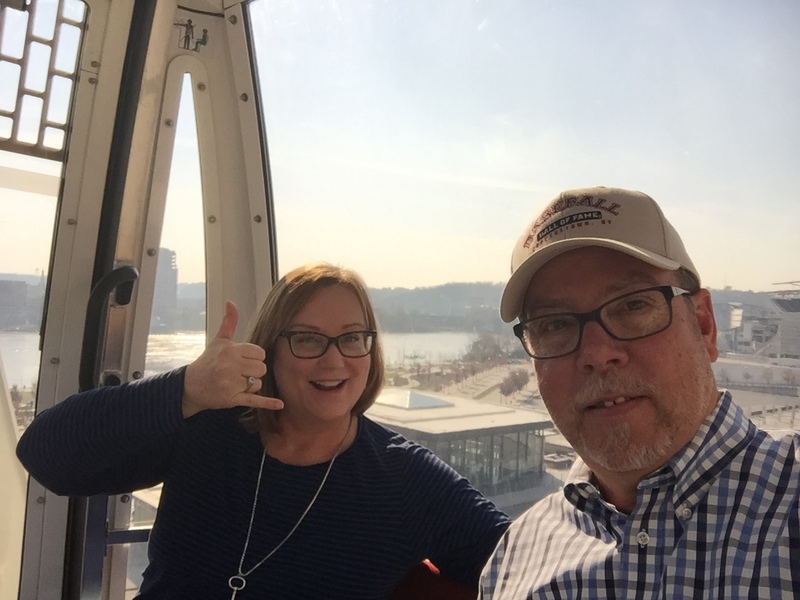 We were downtown on Sunday to find a fun sports bar so Colin could watch his beloved Steelers play the Jaguars, but when we exited the parking garage we saw the ferris wheel and Barbara really wanted to ride on it. The line was short, so we bought tickets and got into one of the pods. It took a while to get to the top, as it usually does on a ferris wheel, because they had to fill the pods five at a time while rotating the big wheel. Finally, when all the new riders were in place (us included) it spun freely and we were surprised it went around four or five times before stopping again. When it did stop, our pod was one spot past the platform where you get off. That seemed odd. We did the stop and go thing for another orbit, and then figured we’d get another few trips around the circle and we’d get off to go find that sports bar we were after in the first place. And as the wheel slowed to let people off, our pod went right past the departure point again. And again. And again. They kept skipping us! It was really getting frustrating, but worse than that it was really getting hot and stuffy in our little pod. It was about 50 degrees out, but the sun was shining and the little glass pod was heating up. I found a way to slide open some vents in the doors, but we were all sweaty and ready to get off the crazy thing. And then they skipped us again, and again, and you see where this is going. Our view and our pod’s shadow, while we were lost in the ferris wheel vortex. We were all sure that each time it stopped to empty a set of pods that we’d be in the next group. It just never happened. Finally, Barbara had enough of the overwhelming fun and she pressed the “Emergency Call” button. When a voice was heard she said, “We’re in pod 12, and you’ve skipped us at least five times. We want off this thing, and we want off now!” When the wheel went around without stopping, she called again. 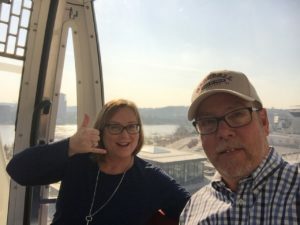 Barb’s response was something along the lines of “Well, thank you for getting us off, but it was way more than just a while.” We were on that thing for an hour!!! Man, it felt good just to get out of that little bubble and get some fresh air. We walked about a block and were on a street where we had multiple options for having some lunch, enjoying a drink, and watching the game. Colin had been to one of the sports bars before, and it was perfect in every way except the part about it being in Cincinnati while Colin is a lifelong Pittsburgh Steelers fan of the highest order. The Steelers may have been playing Jacksonville, but the Bengals were on most of the TVs and just about everyone in the bar was decked out in their Bengals gear. For the record, the Steelers and Bengals rivalry is on a par with Yankees – Red Sox but if anything maybe a little less civil (if that’s possible). Colin doesn’t back down, though, so he was proudly wearing a Steelers t-shirt that was actually aimed at Bengals fans, while in a rowdy room filled with 100 people wearing tiger stripes. Everyone was friendly, though, so it was all good. And we had a ton of fun. It was great to see Colin and stay with him in his great apartment. So glad we went. We were only home a couple of days, though, because on Wednesday we flew down to Orlando for Thanksgiving. I need to start this part of the blog right at the most important part. 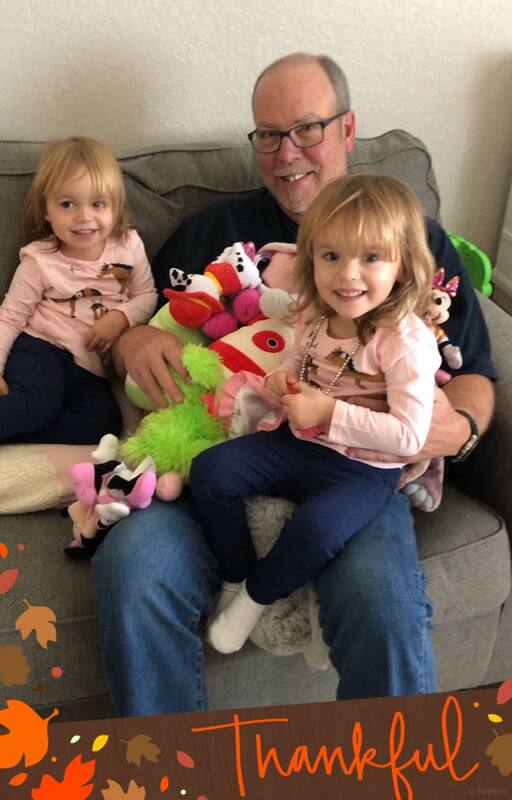 Todd and Angie’s twin daughters are incredible, and so adorable. They are also not starved for stuffed animals and other toys, most of which are educational while also being fun. The only hitch for me is that Stassi (short for Anastasia) is terribly shy around me. Last year, when they came up to our place she finally warmed up enough to at least bat her eyes and flirt a little with a cute smile, but if I came too near she got nervous. The same thing happened last time we were in Orlando, when she really had a bad case of “the shy syndrome” and would cover her eyes if I so much as made eye contact. All the stuffed animals! And the adorable twins, Bella on the left and Stassi on the right. That’s how it was for many hours after we arrived last week, with shy Stassi being the counterpoint to outgoing Bella (short for Arabella) who talks up a storm and laughs at everything. After many hours on our first day down there this time, out of the blue Stassi grabbed her favorite stuffed animal, a little puppy, and walked across the room to hand him to me. It was wonderful. Before long, both the girls were emptying the bin where the stuffed animals live and bringing them all to me, one after another. And then they joined me on my corner of the sofa. I thought we were over the hump at that point, and we were for the rest of that day, but in the morning it was as if it hadn’t happened. The ice had to thaw all over again. And that’s how it played out every day we were there, until we left on Sunday. If you haven’t seen the movie, Drew Barrymore plays a young woman who has brain damage from a car accident. The symptoms make it so that she never remembers anything that happened the day before when she wakes up in the morning, and her dad and brother go to extreme lengths to make every day seem like the same day, over and over. Adam Sandler falls in love with her, but each time they connect and it seems like he’s met the girl of his dreams, she has no idea who he is the next day. In the end, he makes a video of the two of them having a great time together, obviously very much in love, and she watches it every morning to figure out who he is and why he’s with her. It was a good movie. Stassi and I need our own version. For the Thanksgiving record, my contribution to the epic feast was the making of my new signature appetizer dish. I made salmon cakes, and every one of them was consumed ravenously. I do have to thank Angie, though, because without her getting up very early and baking the fresh salmon for me, we wouldn’t have had enough burners or stove space to all be in there together. All I had to do was take the two 8 oz. filets she baked and turn them into cakes. There’s actually a lot more to that than it sounds. Lots of ingredients to chop and mix in just the right order. Just before dinner, I put the cakes on the cooktop, made some Bearnaise sauce, and plated my delicacies. Yum. Don’t have winter? Create one! It was big fun, too. The next big adventure in Orlando was really fun, and a little humorous for two Minnesotans. Whether it’s local Floridians or visitors from other places, there are a lot of people in Orlando who really don’t know what a serious winter is like. So, they create one! It’s called “Ice” and it fills a huge convention space at the Gaylord Palms Resort. 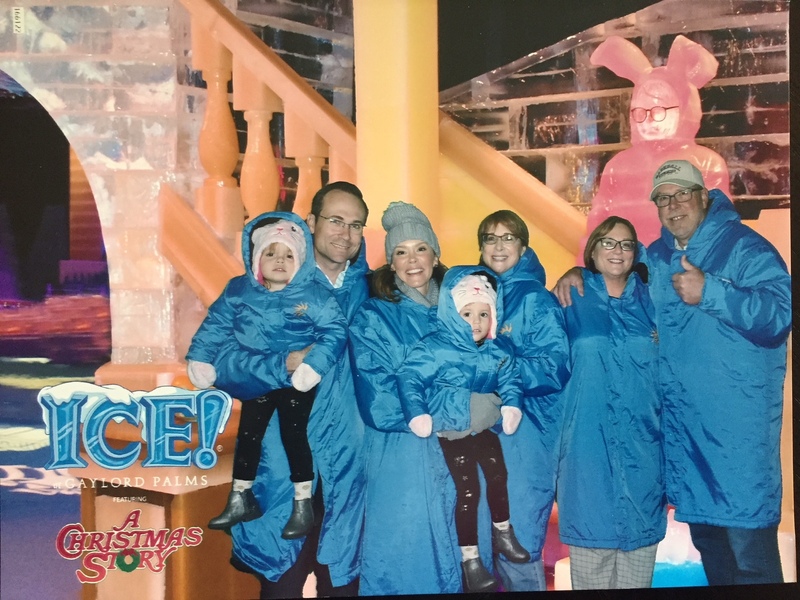 Somehow, they use massive refrigeration units to get it down to just 9 degrees (yep, you read that right, they get it down to 9 degrees) and as you walk through the winding path you see fantastic ice sculptures. You’re basically surrounded by ice, and it’s legit cold in there. They provide everyone with a parka, but I was not totally understanding just how cold the place would be. Gloves would’ve been nice. Actually my hands only got cold at the end of the 20-minute stroll through the sculptures (the theme was the classic movie “A Christmas Story”). The Floridians? They were freezing, but the twins loved it. 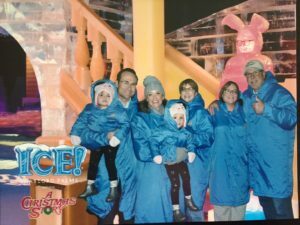 They slid down the ice slide over and over. A manager saw us and our frustrated faces and came to the door immediately, saying “We’re closed but we’re still serving and we’re actually waiting for your group. We have a table all set up.” That was nice of them. Gus and Gracie. Two ultra-cool cats. Usually when you think of a buffet you envision stuff from a cheap casino. This place was actually stellar. Carving stations, fresh salads, fish, and all sorts of sides. We gorged and it was really great. 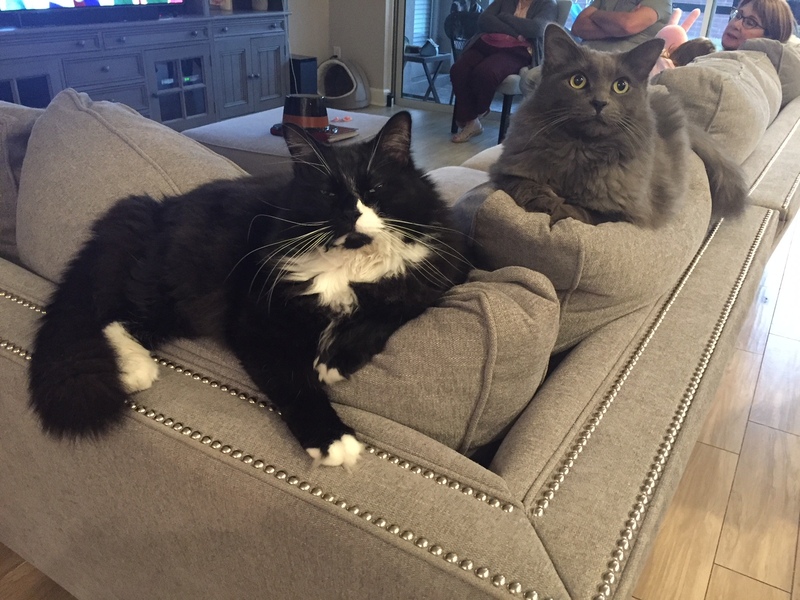 On the right are Gus and Gracie, two of the four cats who allow Todd, Angie, Stassi, and Bella to share their home. These two are incredibly lovable, and crave head and belly rubs. Very cool felines of the highest order, as is Cocoa the Siamese. Cheeto, the fourth cat, is friendly and fun too, but a little more shy than the other three. I had a riot with these guys. And yes, Gus and Gracie are both big kitties, and are actually litter mates. There’s a lot of hair involved with both of these two. Bella and Stassi both love to dress up, and thanks to Angie, Kitty, and Barbara they are not at all in any danger of running out of cute costumes and outfits. They are HUGE Disney fans, and watch Disney Junior TV most of every day. I’ll admit I got a little hooked on it too. I think the girls have at least six Minnie Mouse stuffed animals. And they can name just about every character on the short movies they watch. But what they really love are princesses. 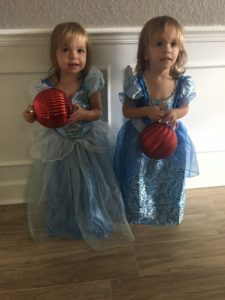 And since that’s pretty much what they are, they get to dress up as princesses a lot. So much so that everyone calls them “the Twincesses.” How adorable is this? Answer: 100 percent adorable. One afternoon we went out to the backyard with some small rubber soccer balls, and Stassi showed me some great skills for a little player who is just a few months past her second birthday. She can run and dribble and kicks the ball really well. I kicked it around with her for a good 20 minutes, maybe more, and I think I had as much fun as she did. She’s definitely a little athlete. Bella, on the other hand, seems not to care much for kicking soccer balls. She does like to swing on the swing set though, so we finished our time in the yard by having Barbara and me push them in their swings and the laughing never stopped. These two love to laugh. It was big fun. So, in summary regarding our Orlando adventures, I ate too much, I fell in love with two Twincesses even if Stassi had to learn who I was all over again each day, we went to a make-believe winter wonderland that was legit winter in a hot place, we consumed mass quantities of leftovers, and we watched a lot of Disney TV. In other words, it was all good. And one last story from the last two weeks. I met an astronaut! A real honest-to-goodness astronaut. Did we meet in Florida? Nope, we met in the Sky Club at MSP before we got on our plane to Cincinnati. It was pretty crowded in the club and there was only one open seat at the dining bar inside the club, so I stood up and let Barbara have the seat as we munched on some food. 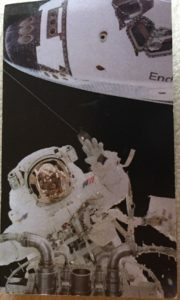 I looked to my right and saw a well-built and handsome gentleman, and next to him on the bar was a ball cap that had “Endeavor – STS 113” embroidered on the front. That would be a Space Shuttle mission. Being a bit bold, I asked him “Were you involved with the Shuttle program?” He replied in the affirmative, so I said “What did you do for the mission?” and he said “I flew on it.” I’ve met a few astronauts in my life, but it’s always in a setting where they are guest speakers or VIP attendees. This was a first for me, and it was an honor. His name is John Herrington. He’s a retired naval officer, and he flew in space. This is the backside of his ultra cool business card. We talked for quite some time, and he was as gracious and forthcoming as anyone could be. He was scheduled to do a mission on the International Space Station, as well, but while in training over in Russia he found out he had a bit of osteoporosis and that got him scratched from the trip. Bone density would be pretty important for someone spending weeks or months in a weightless environment. He was definitely bummed he couldn’t make the trip. Our traveling adventures still have the two biggest trips yet to come. Next Wednesday we fly overnight from MSP to London Heathrow (with a layover in Detroit) and will return on Sunday. That’s just enough time for the jet lag to finally settle down before you turn around and fly back this way. Then we’ll be home almost two weeks before we head west, first for the Kona side of the Big Island of Hawaii, and then over to see my wonderful sister Mary and her husband Lonnie, on Kauai. And Kitty gets to tag along on that trip. Much fun awaits. So that’s it for this week. There were lots of tales to be told and I left out as much fun stuff as I wrote. Bob Wilber, at your service riding endless ferris wheels, hanging out with Twincesses, visiting a fake winter, and meeting an astronaut.